“We aren’t going to make it Captain,” a young sailor worriedly shouts at his boss as he bursts into the bridge. The Captain furrows his brow and pushes a lever forward on the console. If he pulls it off, he’s a hero. He’ll surely be promoted. It’s all down to this one delivery, getting his soy bean cargo to port in Dalian before the trade war tariffs are implemented. If the ship makes it, the company gains a 25 percent trade advantage. In my vision of how this all went down, this is the perfect plot line to a 1980s kitsch action film. The name of the boat, and the faux film based on this story, is Peak Pegasus. In the film version of this action sequence, Brad Pitt plays the captain of the ship, and of course he makes it to Dalian, by hook or by crook, before the deadline. Minutes under the wire, naturally. In reality, however, Peak Pegasus did not make it to port before the tariff was implemented, missing by mere hours. The tariff was set to go into effect on Friday evening. The ship was scheduled to arrive in Dalian by 5PM, but was slightly delayed, and did not have enough time for its paperwork to clear customs before China’s retaliatory 25% tax bump took effect. In Peak Pegasus there is a happy ending for the shipmates, the soybean farmers, and American pride. In the real world, we’re stuck with the sad reality of this situation. The trade war between the U.S. and China has begun, and neither show any signs of letting up. In fact, China has urged European nations to form an anti-U.S. trade alliance. 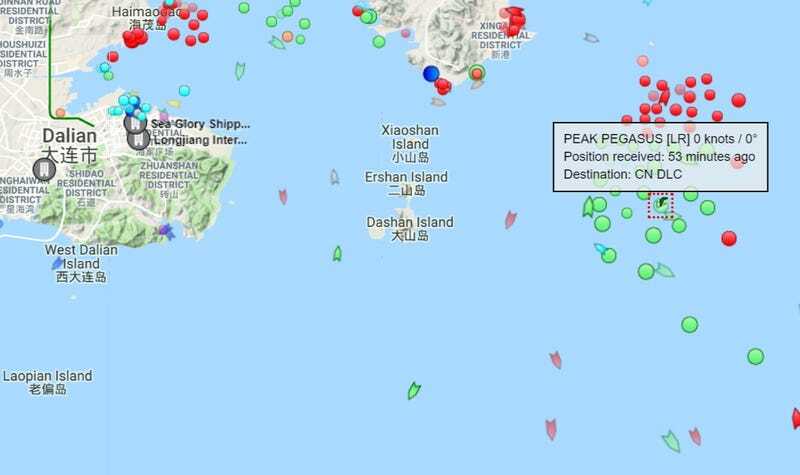 Peak Pegasus is currently waiting to offload in a holding pattern off the coast with tons of other ships. Their story is done and over with, but the larger global trade story is just beginning.